Das Leben, ein endloser Straßenkampf. wir teilen uns die Zigarette. 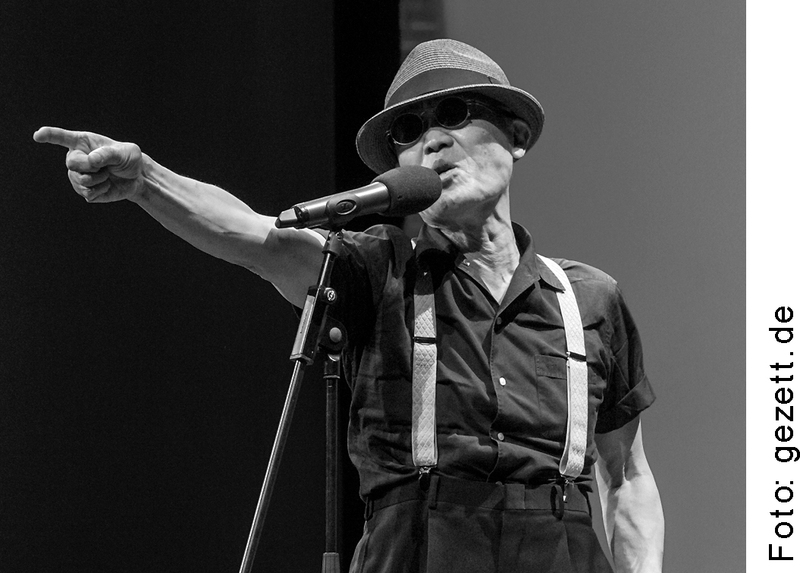 Yasuki Fukushima (born in 1943 in Tokyo) is one of the most expressive of contemporary Japanese poets. He writes in the form of the tanka, a 1300 year-old form strictly comprising 31 syllables. Fukushima played a leading role in the modernisation of the tanka in the 1960s, when he began writing about current themes such as the student movement in which he was involved. Fukushima’s social commitment and experimental performance forms both date from the 1960s and 70s. He performs what he calls his ‘zekkyō tanka’ (screaming tankas) to musical accompaniment, loudly and passionately. In his performances he makes spontaneous changes in the sequence of the texts, creating ever new connections of sound, motif or emotion between individual poems. Fukushima also places his poems in dialogue with texts by other writers, blurring in performance the boundaries between art genres, and between what is his and not his. His performances are like jazz: a free interplay between themes, voices and variations. No two performances of his are ever alike. Yasuki Fukushima has written thousands of tankas and published more than 39 books of verse as well as essays, CDs and DVDs. Aside from his work as an artist, Fukushima has been a Buddhist priest in Tokyo for many decades.